It’s been the story all spring: the University of Miami is looking for a replacement for former starting quarterback Brad Kaaya. But with the ongoing search, there has been a decreased emphasis on running-back play. This has exasperated one of the Hurricanes’ stars. Junior running back Mark Walton, an All-ACC player whose 1,117 rushing yards led the team in 2016, has been placed on a “blocking diet” – meaning he has been asked to do a lot more blocking than running the football. “I don’t like being babied,” Walton said after practice Tuesday afternoon. The coaching staff has put Walton in this role for two reasons: to focus more on the quarterbacks during scrimmages and to monitor the hits Walton takes during spring training. This precautionary tactic is done for good reason. Since the Canes already know the type of production they will get from their starting back, there isn’t much left to discover during this time of the season. This is unlike the quarterback position, where only one of the possible starters has seen game minutes. Miami also has just one healthy, scholarship running back behind Walton on the depth chart – Travis Homer. Robert Burns and Trayone Gray are still recovering from injuries and likely to miss the rest of spring. In other words, Walton can’t get hurt. Despite his clear discontent, Walton understands the reasoning behind this tactic, as well as the value he brings besides running the football. Coach Mark Richt isn’t worried about his workhorse but wants to ensure that he stays healthy come fall. 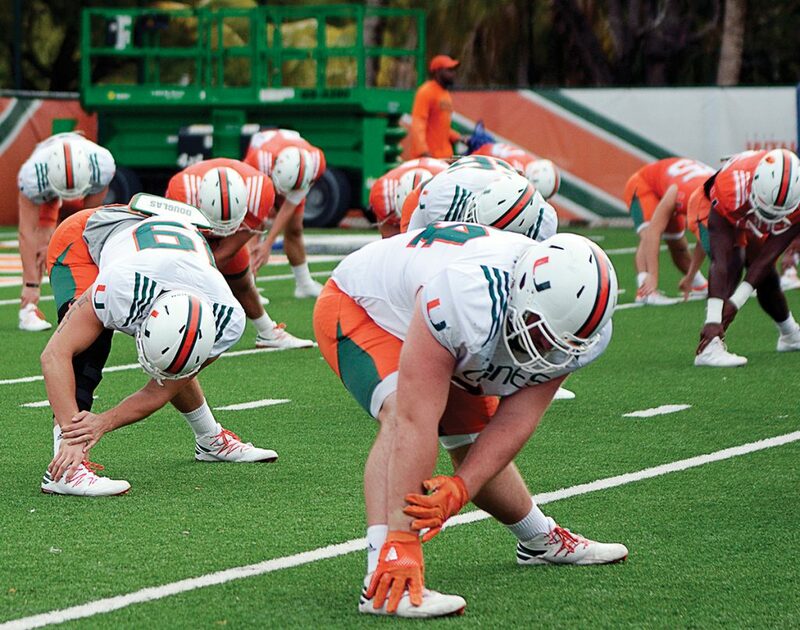 Miami knew it needed to address the offensive line this offseason. Both freshman Navaughn Donaldson and junior Tyler Gauthier have been holding their own against the first and second-string defense, defensive lineman Kendrick Norton said. Redshirt freshman quarterback Jack Allison, who missed time last week because of a shoulder injury and concussion, was back as a full participant in practice. He is expected to be in the rotation for Saturday’s scrimmage, which will be the third and final one for the Hurricanes this spring. The scrimmage will take place at Boca Raton High School.